Now this is WAY COOL! You can capture way more than just a picture with the Panono Camera and discover a whole new experience. Send your Panono up into the air. What it brings back down will simply amaze you. This goes way beyond the typical panoramic picture. The Panono Camera captures moments in their entirety that can easily be viewed and shared, providing a whole new photographic experience. 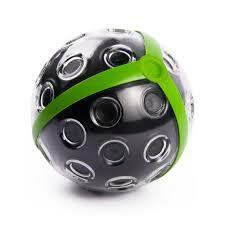 One quick toss of the Panono Camera will capture everything in every direction into a high resolution 360° X 360° full- spherical 108 Megapixel panoramic image. This is available for pre-order now, allowing you to take photography to the next level! This kind of fun does not come cheap, it will set you back in excess of $500 USD. I gotta get my hands on one of these! Check out the Panono Website!